Why are my coralline algae bleaching out and turning white? Do a search on the Web for information on "coralline bleaching" and you'll see just how often this question is asked. Browsing through the many forum postings that pop up in the results, it is amazing that in the quest to find an answer for coralline algae bleaching woes, seldom is light mentioned or seriously considered as a possible cause. Typically salinity, temperature, pH, alkalinity, nitrate, nitrite, ammonia, phosphate and other such water parameter info is shared, but lighting conditions are usually excluded from the equation. Why? Coralline algae are encrusting red algae, and the two primary elements that all calcareous species of algae need to grow are calcium, to form their encrustations, and light, which gives them color. Even though light is essential, coralline algae are also photosensitive, meaning they readily respond to the type and amount of light around them at all times. 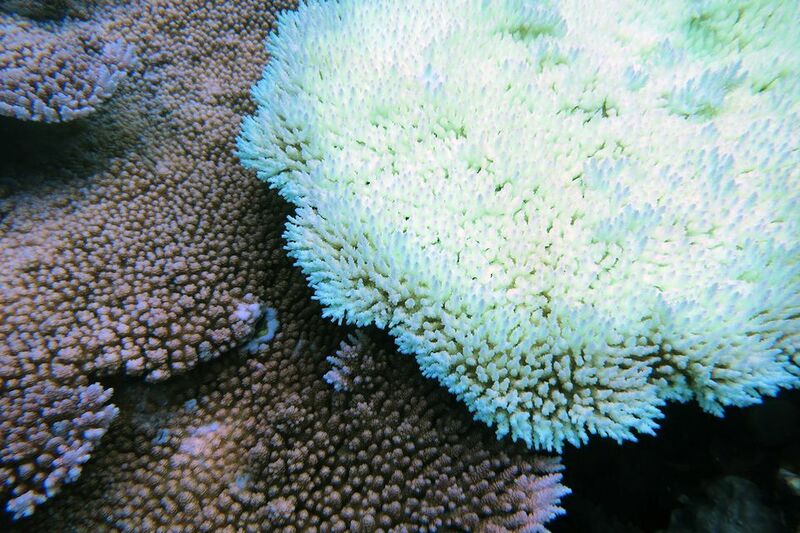 Light shock is simply a term used to describe is a "suspected" or "potential" cause of why coralline algae, corals, and other photosensitive reef organisms bleaching out or turn white is light shock. Light shock is defined in the glossary of "Aquarium Corals" as, "stress in corals resulting from a rapid change in lighting conditions; a potential cause of bleaching. ", which can be broadened to include coralline algae and other photosensitive reef organisms as well. Now even though technically coralline algae are not coral, but encrusting species of red algae, just the same they incorporate the use of calcium carbonate and are photosensitive reef organisms that respond to light in ways that corals do. Have you ever seen coralline algae loose color, or worse, turn completely white and die-off after having done a water change on your aquarium? Do you know why it happened? The odds are high that the aquarium lights were left on during the water change, and light shock was the cause. Coralline algae are described as "a generic term for the many species of red algae that incorporates calcium carbonate in their encrustations". Just like many corals, these encrusting red algae too are calcium based or calcareous reef organisms that respond to light in the same ways that corals do. in this particular case, light shock was without a doubt the cause. How do we know that? Because we took pictures to document the event. This is a photo of a 75-gallon coral holding tank a day after we did a water change on it with the tank lights left on. You can clearly see that the coralline covering the bottom half of the aquarium is colorful, while the top half is white. It appears as if someone just drew a line vertically through the aquarium, dividing the two sections. With the aquarium lights left on as usual, during a routine less than 30-minute process of siphon cleaning the coral rubble substrate and doing a water change, all coralline algae above the water line bleached out. Having maintained this coral holding tank for several years, this procedure was no different than any others had done. Why Had This Not Happened Before? Up until this particular water change, very little coralline algae had been present on the upper areas of the aquarium glass, but that changed. With the development of much new coralline around the top area where it had not been before, as the water was drained from the aquarium, it was exposed directly to With no water covering it, and therefore without this buffer to protect it from sudden exposure to the aquarium lights, it caused the coralline to turn white. This suspected reason also relates to a similar experience with a 55g reef tank we had in Hawai'i. The two 50/50 bulbs on this aquarium had gotten to be over a year old, but the color of the coralline algae was beautiful. After replacing the bulbs there was a sudden fading of color of the coralline, with much of it turning nearly white. The color slowly returned to the coralline, but we did observe that as the spectrum of the aquarium bulbs again diminished over time, the color intensity of the coralline increased. #1) Will the bleached coralline algae regain color, and if so, how long will it take? We'll check the color of coralline on a regular basis and document any observed changes. #2) Was it exposure to the light that caused the bleaching? Since we know that both air and light were factors in this particular occurrence, during the next water change we will turn off the tank lights (ESU Coralife Aqualight fixture with 2 x 150 watt HQI bulbs and 2 x 96 watt actinics) to compare the results. Once we have all the comparison test data together, we will post the findings here for you to read. What The Heck Is That In My Aquarium?